Marciano Estate represents, quite simply, the best wine that we produce each vintage. It took us years to get here. Years of experimenting, getting to know the land, the geology, the soils.  Of letting the vineyard mature and understanding the vines and through them, how the site expresses itself. Produced in quantities dictated solely by quality, Marciano Estate represents years of striving for what can only be called a beautiful expression of a singular vineyard. From the small block of iron-rich soils that form the core of the Marciano Estate Cabernet Sauvignon, the 2015 vintage produced a wine that is rich and lush with beautiful texture and concentration. Complex flavors of cassis and blackberry layered with black plum and mocha, complement hints of star anise, sarsaparilla, silky ripe tannins and the long, graceful finish. This vintage is already expressing its decadent flavors and can be enjoyed in its youth with a time in a decanter. Those with the patience to cellar their wine will be rewarded, as the 2015 Marciano Estate Cabernet Sauvignon will age gracefully for decades to come. M Red Wine is a rich and layered Bordeaux blend that balances the density and power of our vineyard’s Cabernet Sauvignon with the silky texture and perfumed aromatics of our best blocks of Cabernet Franc. This wine’s lush flavors and supple structure make it generous in its youth while allowing the wine to age gracefully for many years to come. The 2015 M Red wine boasts aromas of black cherry, crème de cassis, violet and espresso. On the palate, the Cabernet Sauvignon adds beautiful concentration, lush fruit flavors and incredible depth. Conditions in 2015 were ideal for the Cabernet Franc, which achieved perfect ripeness and contributed to the wine’s expressive bouquet and silky, refined texture. The addition of Petit Verdot completes the blend, resulting in a seamless wine, and showcasing the complexity and amplitude of our ten-acre estate vineyard. From a single acre of estate-grown Sauvignon Blanc, our fruit is harvested in successive small picks to accentuate the nuances of the vineyard and add dimension to the resulting wine. The Marciano Estate Blanc is aged in a combination of small concrete and French oak barrels to yield a layered wine, elegantly balanced for longevity. The vibrant 2017 vintage has captivating notes of nectarine, lychee, and minerals, complemented by hints of honeysuckle and citrus zest. The wine is ne-spun with great texture, balanced acidity, and a rich, lingering nish of lemon curd, spearmint, and touch of chalky minerality. This wine is estate grown, hand-picked, sorted and slowly fermented under strict kosher supervision to produce a non-mevushal wine. After fermentation, it is delicately barrel aged for 18 months in 60% new French oak, then and bottle aged for an additional year allowing the wine to mature. Capturing the essence of the Marciano Estate Vineyard, the 2016 Terra Gratia Kosher Red Wine is a blend of Cabernet Sauvignon and Cabernet Franc, this non-mevushal wine has a vibrant ruby color and superb richness. Its aromas are expressive, with layers of cassis, blackberry, hints of dried herbs, graphite and lavender. The palate is lush with flavors of ripe marionberry and black cherry complimented by star anise, espresso and dark chocolate. Full-bodied and balanced, the wine’s silky tannins slowly build to its long finish.